The third largest city in the state of Connecticut, New Haven contains numerous scenic locations for your engagement photography session. One of the most famous buildings in New Haven’s downtown area is the New Haven Public Library, located on the edge of the Yale University campus. Here, your engagement photographer can organize a portrait of your and your fiancee beside one of the towering Corinthian columns or seated on the building’s white marble steps. Your photographer can also use the ornate front entrance to frame an intimate photo of you and your loved one. Afterward, the two of you can pose beneath the trees in the foreground of the building or beside one of the immaculate lamp posts, using the library’s gorgeous neo-Georgian architecture as a backdrop. Once you’ve finished at the New Haven Public Library, take a short walk over to Wooster Square, located just a few blocks away from the Yale campus. A popular photography location for tourists and New Havenites alike, Wooster Square is a small downtown park famous for its countless cherry blossom trees. Have your photographer take some candid photos of you and your fiancee as you take a leisurely promenade along the path that dissects the park. Dry weather permitting, you and your loved one can also relax on the square’s lush green as your photographer takes some snapshots. Finally, pose for some truly romantic photos beneath one of the pink cherry blossom trees, which provide an amazing floral display in the Spring. As a finishing touch to you engagement photo album, take a stroll along Long Wharf Park, which runs along the small waterfront district that goes by the same name. Here, your engagement photographer can snap some casual photos as you and your loved one take a walk along the fenced-off path. You can also pose for an intimate portrait out on Long Wharf Pier, which extends into the New Haven Harbor. The prominence of New Haven in American colonial history makes it home to a number of historic buildings and landmarks. One of the most intriguing of these sites is the famous Pardee Morris House, a remnant of the Revolutionary War, which will provide a unique location for your engagement photo shoot. Once you arrive at this New Haven treasure, you can have your engagement photographer take some photos of you and your fiancee one the expansive front lawn or beneath one of the large shade trees in the front yard. 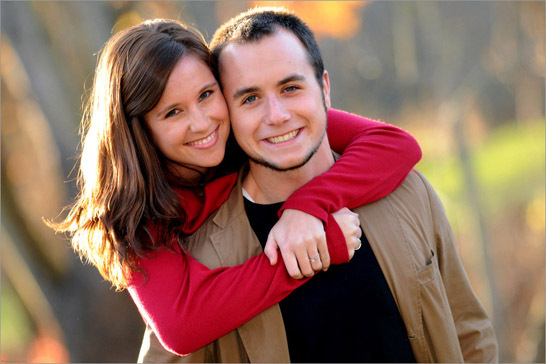 Afterward, your engagement photographer can frame an intimate portrait near the front entrance of the house. You and your fiancee can then explore the exterior of the structure, stopping to pose in front of the white walls. Certain sections of the exterior walls are covered in aged red brick and will provide some rugged backdrops for your engagement photos. After you’ve finished at the Pardee Morris House, take a short drive over to Fort Hale Park- another one of New Haven’s historic sites, located just a mile away. The park contains a preserved fort from the late 18th century that is open to the public today. You and your fiancee can start off by walking through the park’s lush grassy areas as your engagement photographer captures some snapshots. Pose for an intimate portrait on the park’s miniature bridge. You can also have your photographer take some photos against the backdrop of the fort’s exterior walls. Finally, walk to the edge of the fort near Morris Cove and take some seated photos on the large rocks that protrude into the water. In addition to its numerous Colonial-era landmarks, New Haven is also home to some of the most gorgeous natural landscapes in the entire New England area. The most beautiful of these can be found at West Rock Ridge State Park, located in the northwestern part of New Haven. The park provides lots a seven-mile winding pathway that will work perfectly for the couple that loves the outdoors. As you and your fiancee explore the unperturbed wilderness, your engagement photographer can use your scenic surroundings as a natural backdrop. At the northwest corner of the park, you’ll find the tranquil Konolds Pond, which is surrounded by lush greenery. If you’re in the mood for an invigorating hike, make the ascent to West Rock Ridge, from the top of which you can enjoy breathtaking views of over 200 miles of New England landscape. From here, your engagement photographer can take some stunning engagement photos of you and your fiancee, using the New Haven Harbor and Long Island Sound to create a amazing backdrop. This natural New Haven treasure is something that you definitely don’t want to miss!